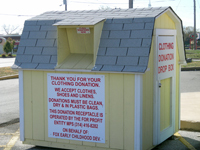 WE ARE STILL ADDING BOXES AND NON PROFIT ORGANIZATIONS TO OUR CURRENT DROP BOX PROGRAM. Once a box is placed it will GENERATE CONTINIOUS REVENUE without further work on your part. Help protect THE ENVIRONMENT while generating funds for your organization. We still have boxes left to place in the region. By placing a box for your non profit organization you can easily raise money each month. The boxes can be placed at churches, schools, retail locations; we even have some at fire stations. There is no cost or obligation on your part or on the part of the host and there is never a contract to sign. MPS provides all pickup service, maintenance, and costs associated with the program. It is very simple to participate and we are here to help every step of the way. Find a place where there is visibility easy access. Contact us with the address where the box is to be placed. It really is that easy. Call Liz Egler at 636-282-0000 to get started.